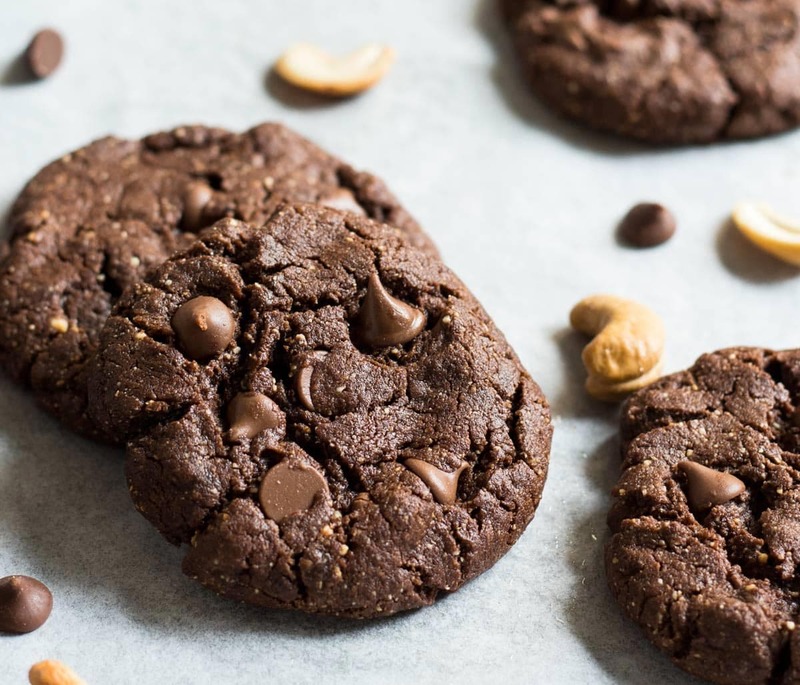 These amazing flourless chocolate cookies are made with only 5 ingredients – flour isn’t one of them! 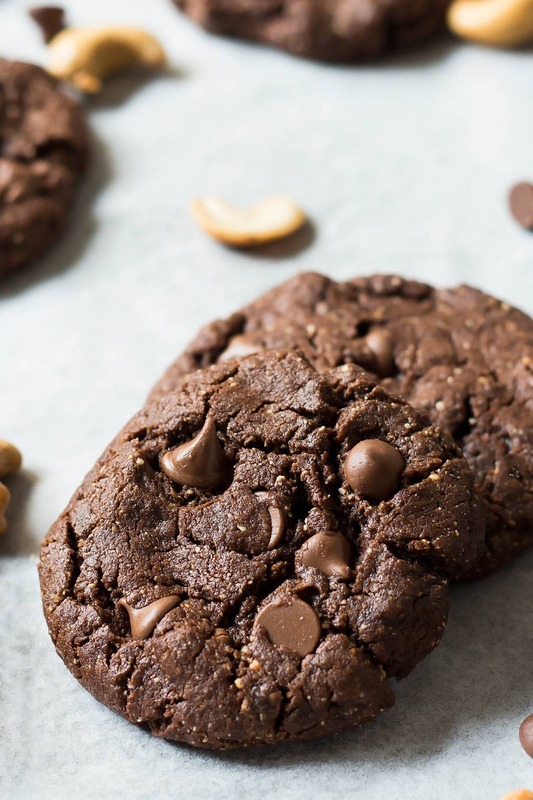 The gluten free chocolate cookies are also clean eating and paleo, and can also easily be made vegan or keto. You probably know already how easy, delicious, and economical homemade nut butters are. I have recipes for coconut butter and homemade almond butter here on the blog. But another one of my favourites is homemade cashew butter. The process for homemade nut butters works basically the same to turn any nuts (and even seeds) into a delicious spread. 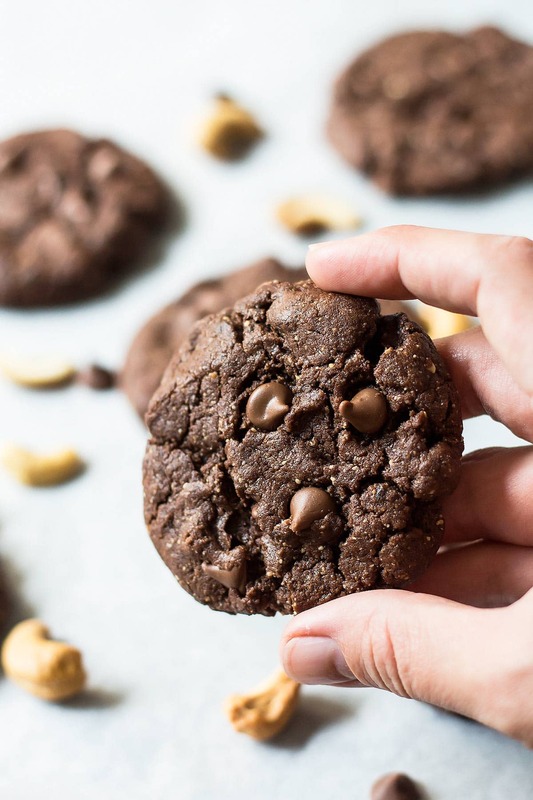 What if I told you now, that you can take that homemade nut butter (cashew butter in this case today) to make the easiest, chewiest, most flavorful chocolate cookies? And these cookies are not only a huge win in the flavor and texture department. 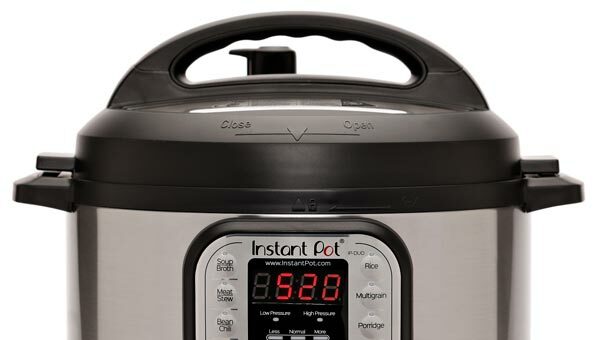 With just little adjustments, they can be made suitable for almost any dietary restriction. How to make flourless chocolate cookies? Making the flourless cookie dough is super easy because there are only 5 ingredients and you can mix them all in one bowl! 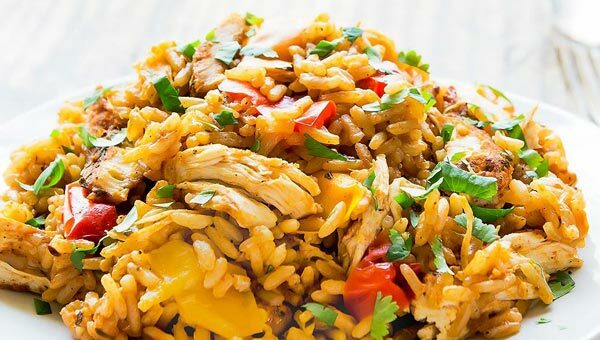 One-bowl-recipes for the win!! In that bowl whisk coconut sugar, cocoa powder, and baking soda to combine. Now add the cashew butter and egg and mix everything together with a wooden spoon or an electric hand mixer until evenly combined and smooth. 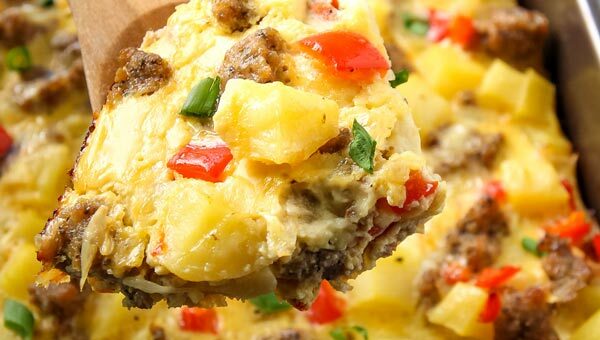 Use a cookie scoop to divide the dough into even portions and place them on a parchment lined baking sheet. Either with your fingers or with the back of a spoon lightly press down to flatten the chocolate cookie dough balls. Bake the cookies in a preheated oven for 9 to 12 minutes. 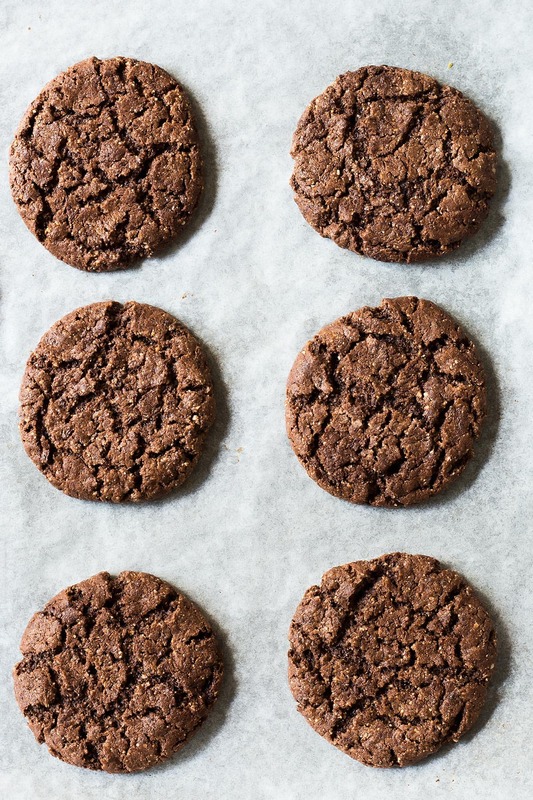 At 9 minutes you’ll get gluten free chewy chocolate cookies with slightly underbaked centers. After 12 minutes of baking the cookies will be crispier. Can a different nut butter be used? Absolutely! Use peanut butter to turn this recipe into peanut butter chocolate cookies. Almond and hazelnut butter would also be delicious. I haven’t tried coconut butter yet, but I think that would be amazing too. For seed butter tahini or sunbutter are great options. Or even pumpkin or hemp seed butter. Usually I warn against using sunbutter in recipes with baking soda or powder, as the two react and can turn the cookies a shade of green while cooling. But I believe that because these are double chocolate cookies the deep brown colour of the cocoa powder would hide any greenish hue. 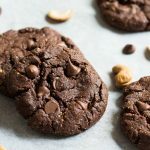 How to Make flourless chocolate cookies keto? Yes you can make this no flour cookie recipe keto, but a few substitutions are required. First of all, replace the coconut sugar with a sugar free granulated sweetener. I recommend Lakanto’s Golden Monkfruit 1:1 sugar substitute. 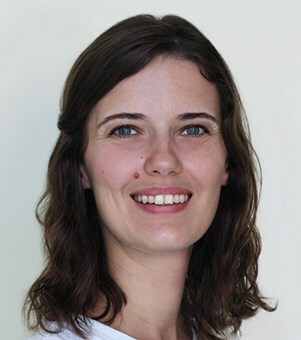 Secondly, if you want to use chocolate chips in the cookies, use a sugar free brand like Lily’s dark chocolate baking chips that are stevia sweetened. And finally, you might want to consider using a nut butter made from nuts that are lower in carbs than cashews. Pecans, macadamia nuts, and Brazil nuts are actually some of the lowest carb nuts. Dairy Free: these flourless chocolate chip cookies are also already dairy free. Aside from the nut butter no additional butter or milk are needed. If you want to add chocolate chips you’ll just have to make sure to use a dairy-free kind. Nut Allergies: Replace the nut butter with a seed butter like tahini, sunflower or pumpkin seed butter. Can you freeze flourless chocolate cookies? Absolutely! Stored airtight in a freezer safe container or freezer bag these cookies can be stored frozen for several months. I actually used these cookies to make frozen ice cream sandwiches. Otherwise store the cookies in an airtight container at room temperature for up to a week. I use a medium cookie scoop that’s the size of about 1.5 tablespoons to form cookies that are all the same size. Using parchment paper to line the baking sheets ensures that the cookies won’t stick and slide off easily. 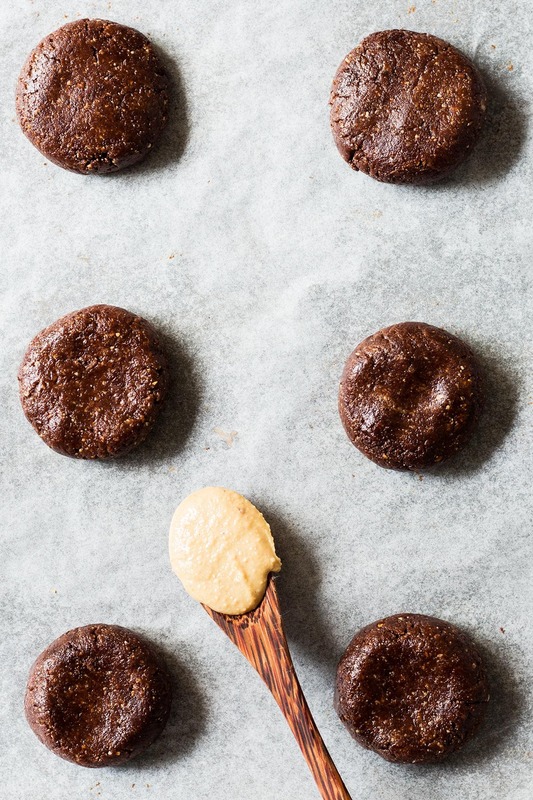 And if you want to use cashew butter without first grinding it up yourself, you can of course also use store-bought cashew butter for these easy chocolate cookies. These amazing flourless chocolate cookies are made with only 5 ingredients - flour isn't one of them! 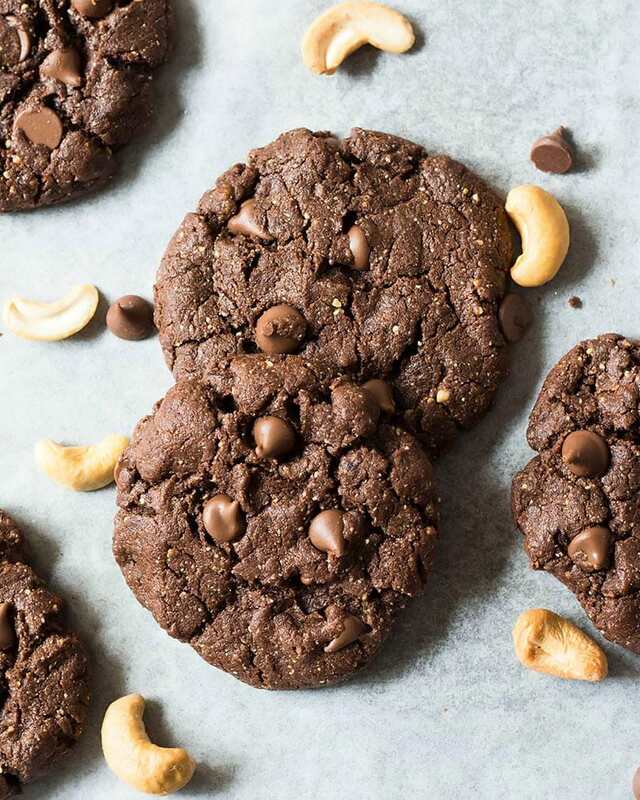 The gluten free chocolate cookies are also clean eating and paleo, and can also easily be made vegan or keto. Preheat the oven to 350° F and prepare a cookie sheet by lining with parchment paper. If using, prepare the flax egg. In a bowl whisk together coconut sugar, cocoa powder, and baking soda. 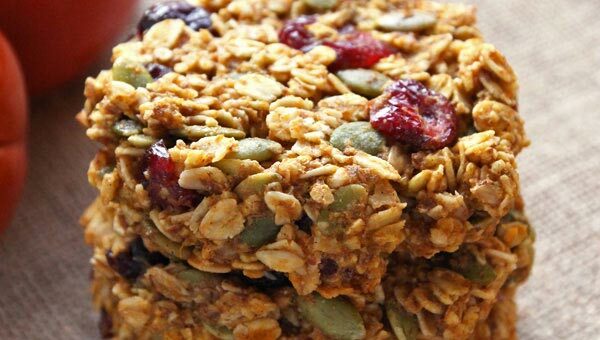 Add nut (or seed) butter and 1 egg (or gelled flax egg) and mix everything (with a mixer or by hand with a wooden spoon) until combined. Stir in optional chocolate chips. Use a cookie scoop (1.5 tablespoons size) to form cookie dough balls and place them on the prepared baking sheet. Flatten the dough balls by hand or press down on them a little with the back of a spoon. Bake the cookies for 9-12 minutes. 9 minutes for chewy cookies, 12 for crispier ones. Let the cookies cool for 10 minutes on the baking sheet, then transfer to a wire rack to let cool fully.